I would like to introduce you guys to my newest sponsor! At Prettymints, they believe that fashion shouldn't be unattainable. A few quality pieces of Prettymints jewelry can transform a look in an instant. For example, a statement necklace can upgrade a dull outfit into a bold ensemble. Me-ow. The Prettymints team works directly with jewelry designers so they can offer their customers the latest trends at affordable prices, which allows you guys to change up your accessories without breaking your bank accounts. Pretty awesome, right? Personally, I've got my eye on the Chevron Rings. 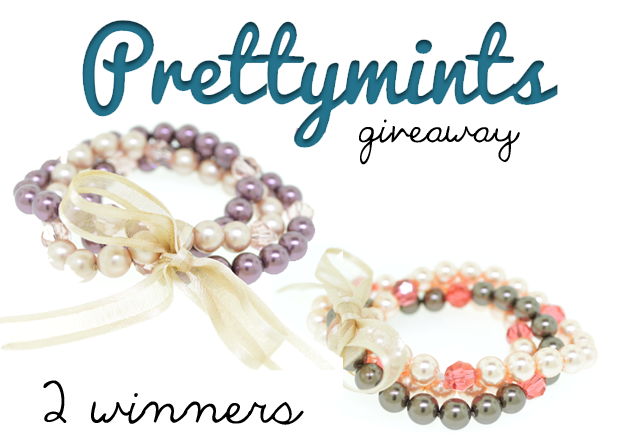 Well, they're giving you two of you guys a chance to win the Pearl Stretch Bracelet in Amethyst or Peach. They're both made with Swarovski Pearls and Swarovski Crystals and they're perfect for any formal occasion. I'm sorry this is a bit late but I'm Lucy Z. I was wondering if (a) there was another Lucy Z. that was a winner or if (b) I was supposed to be contacted some way? I'm not sure if it got stuck in spam or something. Once again, I apologize for not replying to this post earlier (also, I'm not even sure if I am the Lucy Z. that was chosen, or if there was another Lucy Z.) but please let me know if there can be some clarification! It's the end of the week and sadly Prettymints has not yet contacted me. Can you please help me out? I just reached out to Prettymints and my contact has been traveling for the past week and a half. She should be sending out emails shortly - let me know if you don't hear from her by the end of the week. Thanks for your patience! No worries - you will get your prize! I'm so sorry to bother you about this again but I was wondering about the company... I received an e-mail from Prettymints about the bracelet and I gave them my contact info. However, after about 4 months I haven't heard back from the company. Can you please help me out? I'm just pretty confused. Sorry again about this, and thank you for your help!